For a brief moment, it looked like Spring Grove was in trouble. Taking on Northeastern in front of a huge home crowd Friday night, the Rockets let a 17-point halftime lead dwindle to two early in the fourth quarter. The chance to hand the Bobcats their second loss — and push their way into a tie atop YAIAA Division I — was in doubt. Then Eli Brooks took over. The Rockets star senior and University of Michigan commit went on a personal 8-0 run, hitting two straight 3-pointers and an additional field goal to extend Spring Grove's lead to 10. 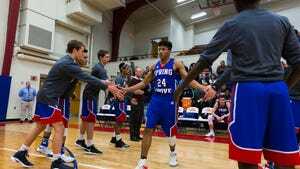 While the Bobcats kept things interesting, Spring Grove held on for a 77-67 win. Brooks finished the game with 38 points, 18 rebounds and six assists. "We needed a spark," Brooks said. "I decided I wanted to get on it. I felt good in warm-ups and it felt good coming off my hand. I felt good the whole night." Since losing to Northeastern by 16 in this season's earlier matchup on Jan. 3, the Rockets (15-4, 10-2) are 9-1 with their only loss coming to Carlisle. On the other hand, the Bobcats (18-2, 10-2) have gone 1-2 the past seven days after starting the season 17-0. What was different Friday than the last time the teams played? Apart from having the home-court advantage this time, the Rockets were able to kept Northeastern's offense in check early while getting the Bobcats into foul trouble. Spring Grove trailed by seven in the first quarter but used a 14-0 run to take a comfortable halftime lead. "Our crowd was definitely into it but it's ultimately about how you want to fight and what type of game and tempo it is," Spring Grove coach James Brooks said. "How (the ball) bounces for you and it bounced in the right way for us at the right times." Added Northeastern coach Jon Eyster: "I think it had more to do with Spring Grove's defense than the crowd. Whether we got those charges because we were jacked-up because of the crowd or not ... I think Spring Grove just played pretty good defense." Early predictions: Which YAIAA boys' teams will reach districts? After a poor-shooting performance in the first half, Northeastern began clicking in the third quarter as the game's tempo sped up. Fred Mulbah and Antonio Rizzuto both started getting to the basket and helped the Bobcats cut their deficit to five points at the end of three quarters. But clutch baskets from Brooks and Austin Panter in the fourth helped Spring Grove hold off the comeback attempt. Mulbah, who missed a chunk of the first half with three fouls, ended up fouling out with about three minutes left. "I trust Fred, and I think the next time I'll still trust him," Eyster said. "We aren't deep, we go to freshman who are inexperienced at some point in time so we have to manage our fouls better." Spring Grove and Northeastern are now tied for the Division I lead and each have two division games remaining. Both teams are currently ranked in the top five in District 3 Class 5A and could meet again in the league or district playoffs. "I said to everybody that I'd rather lose this game and win the one that counts just like (we) did (last season in the league title game) against Central York," James Brooks said. "Now we just have to win two of them."